A thickness of sub-100 µm (0.1 mm) is desired for most frequency conversion processes of 10 fs pulses. In particular, crystals as thin as 10-20 µm may be needed for reaching shorter wavelengths. Newlight Photonics Inc. can offer thin LBO crystals for frequency conversions of very short pulses. Thin LBO crystals are typically offered uncoated. Anti-reflective coatings (AR-coatings): Multi-layer dielectric single-band, dual-band and broad-band AR coatings on LBO surfaces are available upon request. For customer convenience and protection of thin crystals, all thin crystals are pre-mounted in a standard 1" (25.4 mm ) anodized aluminum (Al) holder. Customer holders ( e.g. 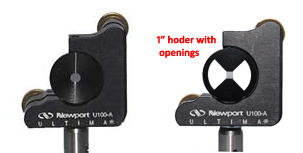 holders with openings to steer a probe beam past the edge of the crystal) are also available at a small cost. 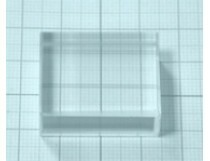 The mounted crystals may be further mounted in a conventional 1" mirror mount to be angle tuned for phase matching (as shown to the right, mirror mounts and posts are not included).